After 54 Years, The U.S. And Cuba Formally Restore Ties : The Two-Way Cuba and the U.S. now have embassies in Washington and Havana. The Cuban flag now flies in D.C.; Secretary of State John Kerry will travel to Havana later this summer to raise the American flag there. 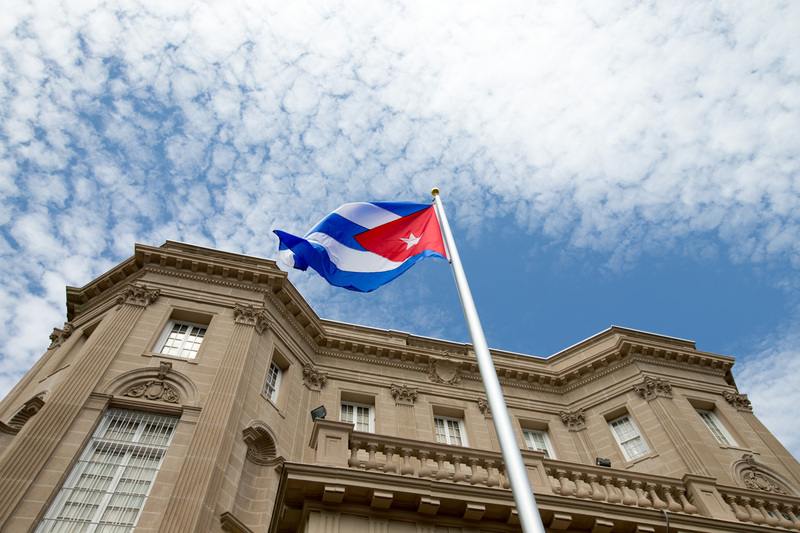 The Cuban flag is raised over their new embassy in Washington, on Monday. Cuba's blue, red and white-starred flag was hoisted Monday at the country's embassy in Washington in a symbolic move signaling the start of a new, post-Cold War era in U.S.-Cuba relations. After 54 years of animosity, the United States and Cuba have formally restored diplomatic ties. That means that the U.S. opened an embassy in Havana and Cuba opened an embassy in Washington, D.C., this morning. During a ceremony full of pomp and circumstance, Cuban Foreign Minister Bruno Rodriguez raised the Cuban flag at the embassy in Washington. 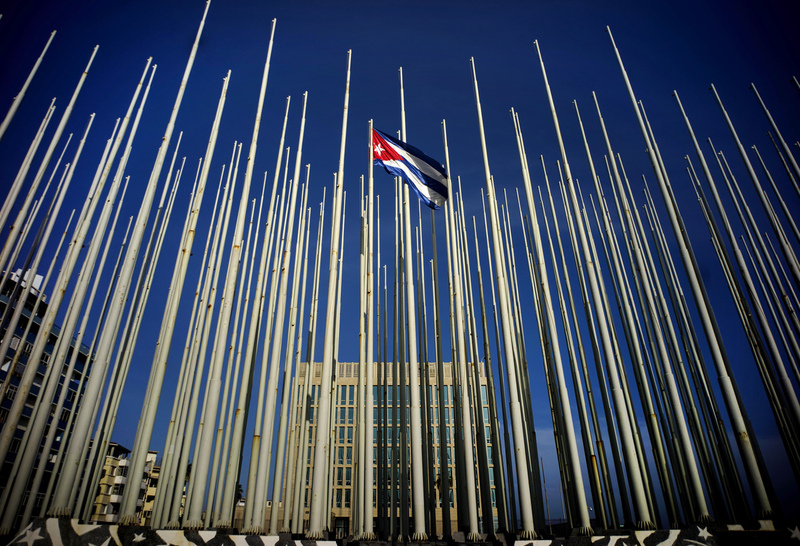 The last time the Cuban flag flew in that location was in 1961, before the U.S. broke ties with the communist island. The streets surrounding the embassy were filled with media and onlookers, this morning. As the Cuban flag went up, shouts of protests could be heard: "Cuba si! Castro No!" Yes to Cuba, No to Castro. In response, others shouted: "Viva Fidel! Viva! Viva Raúl! Viva" Long live, Fidel. Long live, Raúl. In a speech after the ceremony, Rodriguez reminded everyone that while the reopening of embassies normalizes diplomatic relations, there are still many thorny issues left to be worked out. "The historic events we are living today will only make sense with the removal of the economic, commercial and financial blockade, which causes so much deprivation and damage to our people, the return of occupied territory in Guantanamo, and respect for the sovereignty of Cuba," Rodriguez said. In Miami, home to the largest Cuban exile community in the United States, a few protesters gathered to denounce the opening of embassies. Demonstrators accused President Obama of being a "coward." A Cuban flag flies among empty flag polls that obscure the then U.S. Interests Section. That building has again become the U.S. Embassy in Havana. Secretary John Kerry will travel to Havana to raise the American flag at the U.S. embassy there later in the summer. Conrad Tribble, the deputy chief of mission at the U.S. Embassy in Havana, tweeted shortly after midnight that he had phoned the State Department. "Just made first phone call to State Dept. Ops Center from United States Embassy Havana ever," he tweeted. "It didn't exist in Jan 1961." If you remember, this process kicked off in December, when President Obama and Cuban President Raúl Castro announced their intention to normalize relations. Since then, the U.S. has eased some travel and economic restrictions and removed Cuba from a list of state sponsors of terrorism.